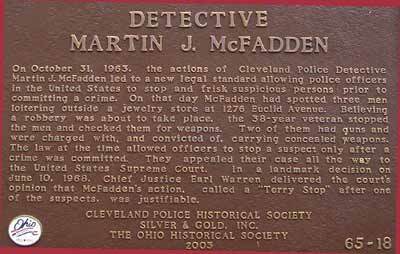 On October 31, 1963, the actions of Cleveland Police Detective Martin J. McFadden led to a new legal standard allowing police officers in the United States to stop and frisk suspicious persons prior to committing a crime. On that day McFadden had spotted three men loitering outside a jewelry store at 1276 Euclid Avenue. Believing a robbery was about to take place, the 38-year veteran stopped the men and checked them for weapons. Two of them had guns and were charged with, and convicted of, carrying concealed weapons. The law at the time allowed officers to stop a suspect only after a crime was committed. They appealed their case all the way to the United States Supreme Court. In a landmark decision on June 10, 1968, Chief Justice Earl Warren delivered the court's opinion that McFadden's action, called a "Terry Stop" after one of the suspects, was justifiable. 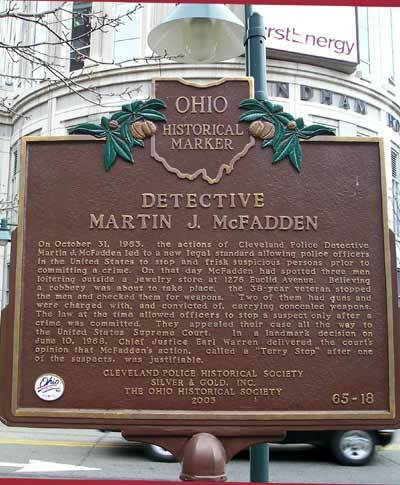 The Ohio Historical Marker commemorating Cleveland Police Detective Michael J. McFadden and the "Terry Stop" is on Star Plaz at 1302 Euclid Avenue. Copyright � 2001-2006 ClevelandSeniors.Com. All Rights Reserved.